Aachen / Maastricht, 05.04.2019. 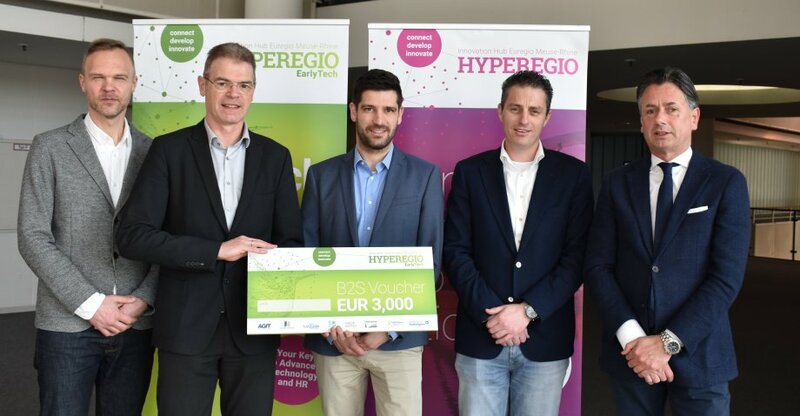 The regional business development agency AGIT today presented two further HYPEREGIO vouchers, each worth 3,000 euros, for cross-border cooperation between small and medium-sized enterprises (SMEs) and knowledge providers. The Maastricht-based company Budé Innovative Solutions and the Aachen-based service provider TLK Energy were delighted to receive one of the so-called “B2S vouchers”. Budé is working on the development of a new machine for the production of flat bag ice, an innovation in the ice cube industry. “With the help of the “HYPEREGIO – EarlyTech” project, we were able to find a euregional partner to develop refrigeration appliances for us on an industrial scale. Without this support we would not have been able to find such a close partner with this enormous know-how in the field,” says Rob Budé, Managing Director of Budé Innovative Solutions. The further euregional cooperation between the Fraunhofer Institute for Production Technology IPT in Aachen and the company FlowChamber, located on the Brightlands Maastricht Health Campus, focuses on the development of a novel device for the analysis of blood coagulation properties. Compared to conventional methods, the results of the analysis can be made available faster, more precisely and more comprehensively by imitating the physiological properties of the blood as it prevails in the human body. In cooperation with the Fraunhofer IPT, FlowChamber takes the first step to develop a medical product to market maturity. Patric Machiels, Managing Director of the start-up FlowChamber, commented: “Thanks to this support, we were able to get to know the renowned Fraunhofer Institute in Aachen. The voucher now facilitates cooperation and brings our medical products closer to the market. I think that HYPEREGIO offers great added value for the Euregio”. In addition, for cross-border cooperation between at least two SMEs, so-called “B2B vouchers” amounting to 6,000 euros each are available in the “HYPEREGIO – Innovation2Market” project. Besides this start-up financing, the 30 project partners also offer SMEs numerous events for cross-border networking and matchmaking. “HYPEREGIO – EarlyTech” aims to improve technology and knowledge transfer and cooperation between universities and SMEs in the Euregio Meuse-Rhine. The aim of “HYPEREGIO – Innovation2Market” is to strengthen innovation-oriented cooperation between technology-oriented companies. Both are EMR Interreg V-A projects funded by the European Regional Development Fund and the regions.